Autodesk Design Competition by Universiti Teknologi Malaysia (UTM) called for ideas of sustainable architecture with a statement "change your future for sustainable living". How can architecture cultivates the future generation for being knowledgable in order to address sustainability in future living? How to cultivate the future generation to become thinking generation in order to change the world into a more sustainable one? How human make use of space and time in a bus stop? Instead of getting people to the library, we engage people everywhere with an instant library. In the Malaysian context, you can hardly find a community library which serves the community and within a short distance of walking, instead, developers and architects decided to put them in the middle of the city where you can barely find any trace of residential community there, this is the first issue. Then, obviously, a reading generation is a thinking generation. The only problem that Malaysian does not often read (according to research) is because of the lack of opportunity and time for them to get to the library facilities. Plus, the working group spends half a day in their office and the other half at home and weekends for their families, do all these places provide the opportunity to read a book and chance to get a resource to read? 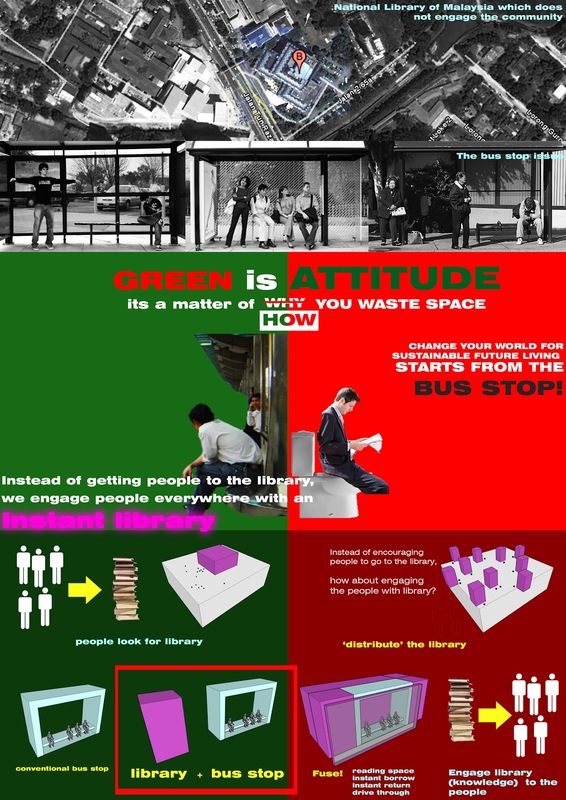 Third, if you ever saw a Malaysian’s bus stop design, where you can barely do anything in that particular space but spend minutes and hours waiting, due to the environmental factors, you notice that during rainy day, people get splashed of water by vehicles passing-by; during sunny day, it is too hot to stay and it is completely wasted of time to wait for a bus due to the extremely unpunctual and poor management of the bus service department. But suddenly, ideas entered. An instance library is now connected to the boring bus stop (Library-Stop), where people can instantly get some reading materials and reading while waiting for the bus. It now has a proper space for people to sit and read a book while waiting for a bus. People get to borrow and return the reading material from bus stop instantly which in terms, encourage them to use the space effectively and intelligently. Library-Stop is now a more knowledgeable and community area where it inspires a different kind of user group to have a common interest which is to spend time reading. In this case, reading a book is how one uses the space and time to wait for a bus at a bus stop. In other word, waiting for a bus has become a less boring idea and it is meaningful because this is the opportunity of time when one gain knowledge! A reading generation is a thinking generation. Ideas make architecture happens and architecture influences how people behave, view and use a space. This is where the world starts changing into a sustainable future living with all the thinking and reading generation.